Approximate locations of robberies by male and female teams posing as ride-hail drivers. 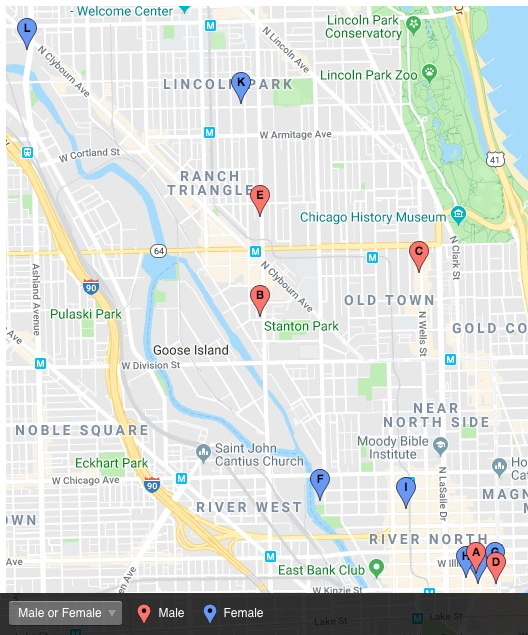 Chicago police today warned the public about a second robbery crew that is posing as ride-hail drivers in River North, Lincoln Park, and Old Town. The warning follows a series of alerts that police have issued since July about a similar operation. The offenders in the latest alert are men while the earlier alert’s suspects are women. Otherwise, their techniques are essentially the same: They either solicit rides while posing as a ride-share service or they pose as ride-hailing cars in busy areas where victims enter their vehicles by mistake. Once the victims are inside the car, the offenders either rob them at gunpoint or beat them until they surrender valuables, according to police. In at least once instance, police believe the offenders' car may have had a fake taxi light on its roof, according to a source.